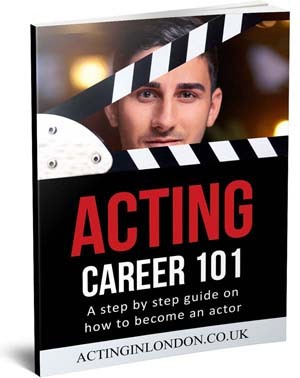 Putting together an acting CV or acting resume will be your first step once you decide to pursue a career in acting. 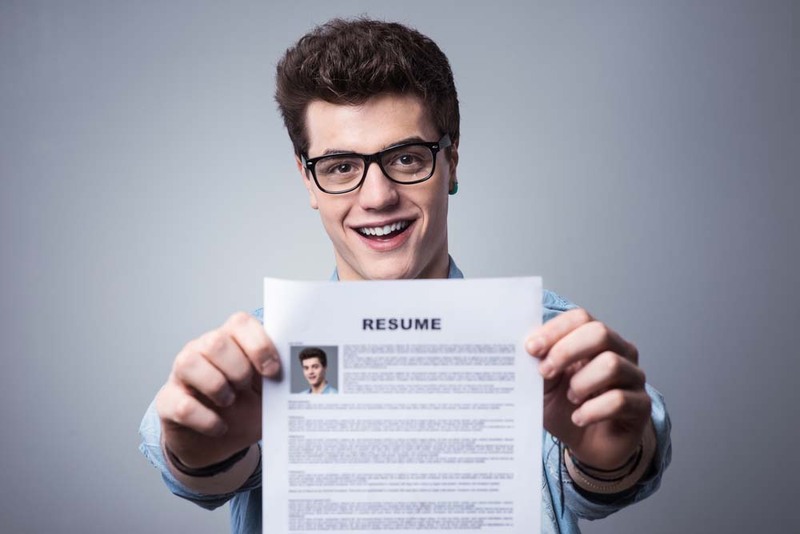 The only thing you need to make your first one is a good acting resume example template. 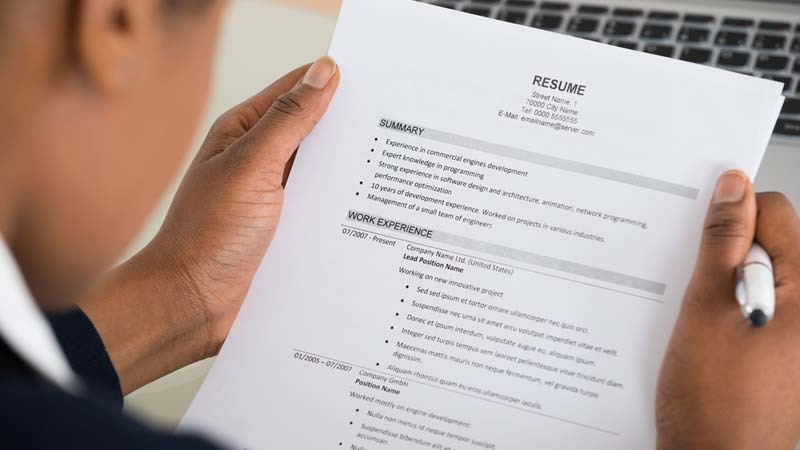 In this article, we’ll take a look at sample acting resume templates and I’ll walk you through the process of how to make an acting resume with no experience if you’re a total beginner. 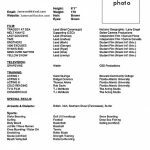 Unprofessional looking acting CV will show you in bad light to casting directors and agents who may potentially want to work with you. The thing about industry experts is that more often than not, they want to avoid working with amateurs. But even if you’re a beginner, as long as you’re able to demonstrate a good understanding of proper acting resume standards, you score a point. 1. 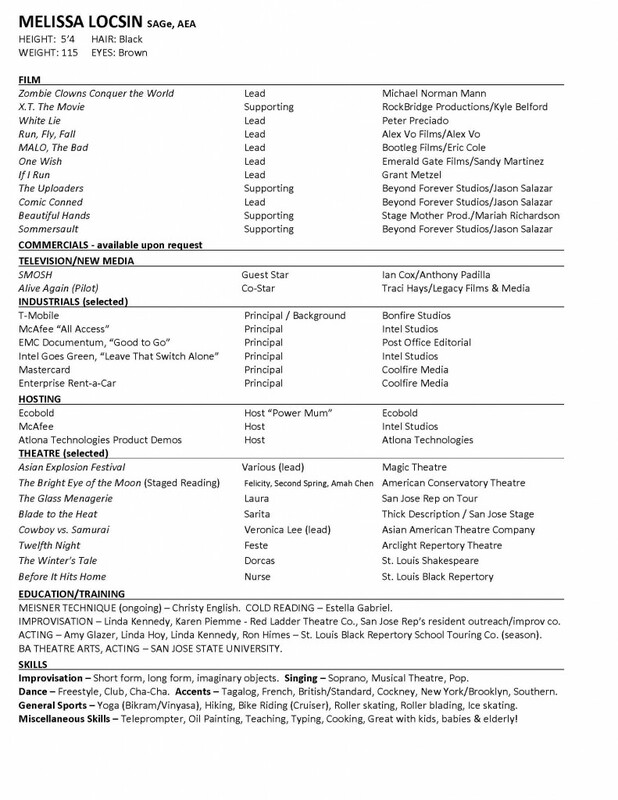 What is an acting resume? If you have ever tried to apply for a job, any kind of job, then you probably know what curriculum vitae is (CV). 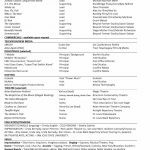 Acting CV/résumé is the exact same thing, only tailored to applying specifically for jobs in film, television, stage and commercials as an actor. 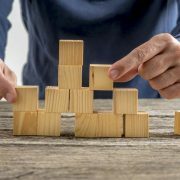 Your acting CV is the first thing you’re going to contribute to your acting startup kit. It’s easy to put together and it costs nothing. Whether you have something to put on it or you don’t is a whole different story, but remember: everybody starts somewhere. An actor resume is the second most important thing acting agents, casting directors and other industry professionals will look at. The first thing they will care about is your actor headshots. If you pass the first stage of “does the actor look the part” based on your headshot, which is something you can do nothing about (aside from getting truly good headshots), you then must do your best to strengthen your chances with a professional acting resume. While each actor’s CV looks a little different and none of them are identically structured, there is a specific acting resume template that everybody follows. 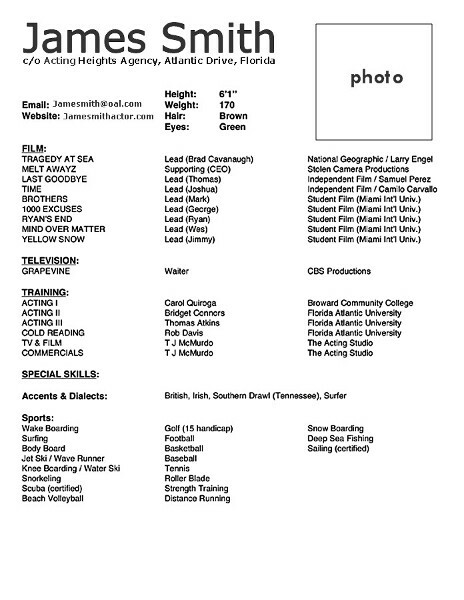 You can see a beginner acting resume example below. 2. What to put on you acting CV? Any specific/unique skills you have. When you’re just starting out in the business, your acting CV will look a little on the “white” side. Try and do your best to fill it with anything that’s relevant. Think of all the skills you have, any small productions you’ve been involved with. At this point you can even put school plays and small acting workshops. You might see your acting resume as not having enough “meat,” and honestly, it probably it doesn’t. However, sometimes, one of those things will catch an agent’s or casting director’s eye, and you’ll get called in for an audition. That one thing could be anything, from your height to your ability to balance a pencil on your nose. Other times, all they want to see is that you’ve had any experience at all, be it a school play or a student film. The way your acting CV is actually structured depends on your own preferences. For example, if you Google “acting CV” and go to “Images”, you’ll see that none of them are exactly the same, but they follow a certain pattern. Always keep numbers 1-3 at the top in this order, and you can switch 4-6 around (but the way it’s listed above is usually the best). On the right side, you can use the US industry standard acting resume example. 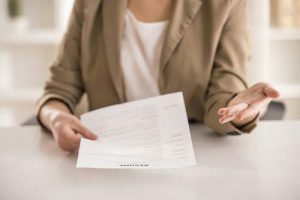 This type of acting resume template is the one that I recommend because it’s less complicated and easy for agents and CDs to scan. Below is the UK’s market acting CV example structure, where they use a small headshot in the corner. 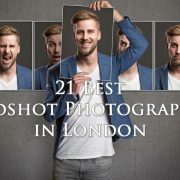 Frankly, I don’t see the point of including a headshot in the corner since you’re sending your full-sized headshot alongside your acting CV anyway (they should be stapled together). Ultimately, they both get the job done in the UK industry. In the US, only the US type of acting resume is acceptable; the UK version will appear odd to agents and CDs. 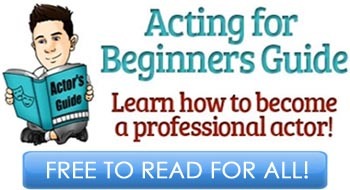 RELATED: Online Acting Classes: Are They Worth It? 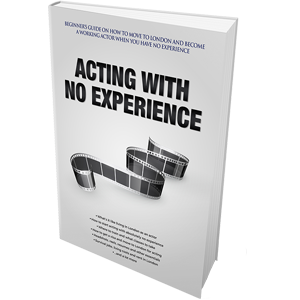 In terms of creating your very first acting CV when you have no experience, there really is no shortcut. You’ll just have to get experience – any kind. 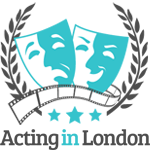 Before you even start working on your actor resume, see if you can join any community theatres, drama clubs, apply to local student film productions, get into any type of acting workshops and acting classes – anything will do. More importantly, see if you can produce a short film or a play yourself. 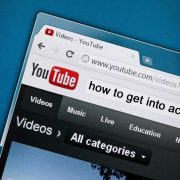 Creating your own content is the best way to get noticed today, which is why many actors are becoming filmmakers, too. To start with your acting resume with no experience, simply put anything you can remember: school plays, films you and your friends put together, etc. The same applies to your training. What if you have nothing at all? If that’s the case, then you may want to hold off from putting together an acting resume. How do you even know if acting is what you want to do if you’ve never done it? If that’s you, then start looking for acting opportunities that are accessible to amateur actors who may not even consider this as their career choice. The ones listed above are your best bet. 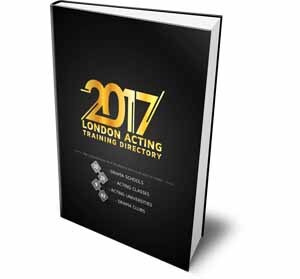 RELATED: Acting Schools and Classes: Are They Necessary? First, remember that your acting resume can only be of a single A4 page. It should also fit nicely with your 8×10 headshot so that you can staple them both together. As an actor, you never leave your home without a batch of acting resumes in your backpack or purse. You never know who you might run into. 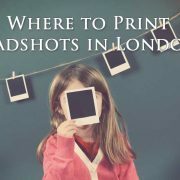 Once you get the opportunity to hand them over, you will also need your headshot, which is why you keep those two stapled together. Once you’re a more experienced actor, drop those credits with less value to keep everything packed on just one page. Another thing to keep in mind is to avoid putting your date of birth and/or age on your acting CV. There is absolutely no need for anybody to know how old you actually are before they cast you. In casting people’s eyes, you are as old as you look. More on the reason behind this in a separate article. As long as you’re legal 18, if casting directors ever ask you about your age, your first response should be: “how old do I look?” Whatever they say is how old you are. They have no business knowing your actual age if you’re an adult. Love it and love you all!